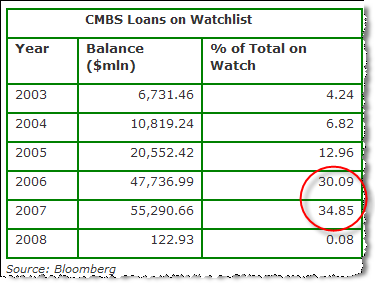 In total, 12,853 loans with a balance of $158.6 billion are on watchlists. They were placed there for various reasons, chief among them is that they failed certain objective financial tests, namely those for debt-service coverage levels. Loans originated in 2006 and 2007 account for an overwhelming share - nearly 65 percent - of the volume on watchlists. 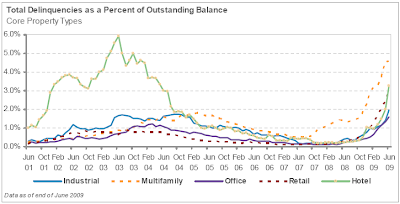 By balance, $47.7 billion of 2006 loans and $55.3 billion of 2007 loans are on the watchlists. During those years, lenders regularly underwrote mortgages based on collateral properties' projected property cash flows, as opposed to actual cash flows. And those projected cash flows in many, and perhaps most cases, have failed to materialize. The drop in cash flow resulted in debt service coverage ratio (the minimum ratio of cash available to the amount needed to pay interest and required principal paydowns.) What's interesting is that a large portion of the earlier commercial mortgages did not require principal amortization. 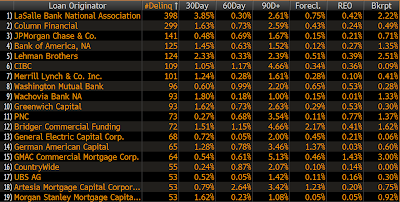 In addition to the refinancing problem CMBS deals are facing, delinquencies in CMBS are now starting to creep up. Multifamily delinquencies have been on the rise for some time now because apartment rentals are heavily linked directly to the more vulnerable consumer. More recently hotel and mall (retail) properties are showing signs of stress. The spreads on senior CMBS paper, though off their peak, continue to stay extremely wide - effectively at distressed levels. Most commercial mortgage-backed securities eligible under published guidelines for the Term Asset-Backed Securities Loan Facility will also meet other Federal Reserve criteria, the Fed told investors on Friday, according one investor and a dealer.